There have been really tremendous advances in dino-science since I was a kid. 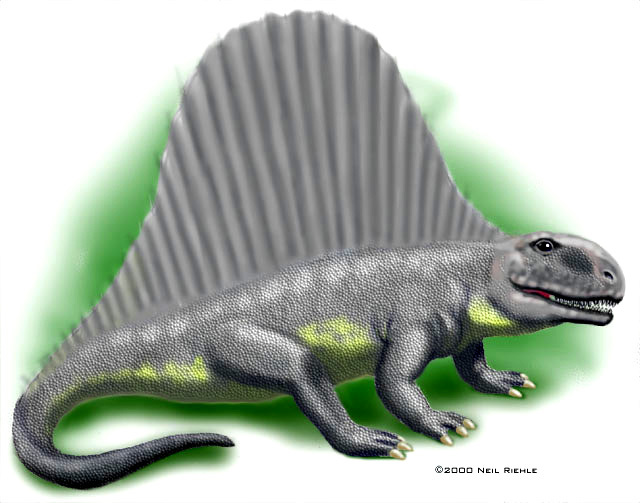 For instance, I just learned that one of my favorite dinosaurs, the Dimetrodon, was not actually a dinosaur at all. It's now classified as a pelycosaur, with specialized teeth and a body heat control mechanism. That means that Dimetrodons are ancestors of mammals, and possibly of humans. Sweet! Being descended from monkeys is kinda lame, but wouldn't it be awesome to be descended from this guy? We now also have fossil evidence that a number of dinosaurs had feathers. Granted, they aren't any dinosaurs you've heard of, but they add credence to the belief that some dinosaurs you may have heard of, like Deinonychus and Struthiomimus had feathers, too. Compsognathus has lost its title as the world's smallest dinosaur to the Parvicursor, which was only about twenty inches long. Finally, I note that some scientists are now calling the tail spikes on the Stegosaurus the Thagomizer, which really doesn't surprise me, considering how many science professors have old "Far Side" comics taped to their doors. My dinosaur book when I was a kid actually did have archeopteryx (yes, I did have to look the spelling up). The others, no.